A recent Pew Research Center survey found that 50% of Americans approve of the government’s collection of telephone and internet data as part of anti-terrorism efforts, while 44% disapprove. In addition, Americans are evenly divided about whether the news media should report on the government’s secret anti-terrorism methods, with 47% saying it should and an equal number disagreeing. Both Democrats and Republicans reflect these divisions. 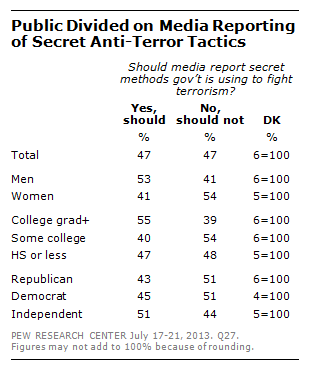 Half (51%) in each party say the news media should not report information they obtain about the secret methods the government uses to fight terrorism. About the same percentage of Democrats (45%) and Republicans (43%) say the news media should report that information. These numbers represent a significant shift in opinion since 2006, when responses to the same question revealed striking partisan differences. A 2006 Gallup/USA Today survey—conducted when President George W. Bush was facing scrutiny for his administration’s anti-terror surveillance programs—found that 59% of Democrats thought news media should report on secret anti-terrorism methods used by the government. Just 26% of Republicans gave the same response. While the issue elicited a 33-percentage-point gap between the two parties in 2006, that gap has since narrowed to just two percentage points. Katie Reilly is a former editorial intern at the Pew Research Center.